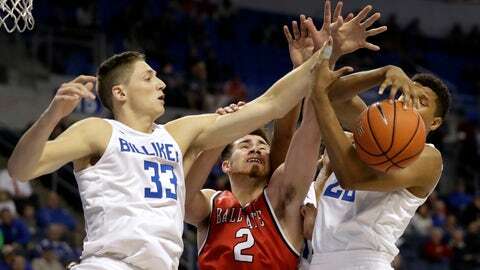 SLU forward Elliott Welmer blocked a team-high three shots in his collegiate debut on Friday. ST. LOUIS — Franko House scored 23 points and grabbed six rebounds as Ball State beat Saint Louis 85-64 in a season opener on Friday night. House was 9 of 12 from the field, including 4 of 4 from distance for the Cardinals. Tayler Persons added 21 points and Tahjai Teague had 10 points and led the team with eight rebounds. Ball State went 30 of 58 (51.7 percent) from the field, including 13 of 23 from three-point range, and 12 of 15 (80 percent) from the line. Saint Louis made 35.6 percent from the field and 64.3 percent from the line. Franko and Persons each hit three three-pointers in the first period to help the Cardinals run up a 43-19 lead by the end of the first period. Davell Roby scored 14 points and grabbed six rebounds for the Billikens. Reggie Agbeko added 12 points and led the team with 10 rebounds.